Mama (Genesis tribute band) set to return to The Forum Theatre in Romiley, 2019! Good news; after the success of our recent show in Romiley, we’ve sorted out a 2019 return date. We thought now would be a great time to let you know, so you can plan your diaries accordingly. We’re planning ours right now. So, the date for the next show in Romiley will be Saturday 16th February 2019! Tickets for this show will be on sale from Monday 12th March on the theatre website. In the meantime, we thought you might like to check out another two videos we took from the recent Romiley show. We have for you…. Los Endos, with our unique Suppers Ready end section and Abacab! If you’re looking for something to do this weekend, don’t forget we are appearing at The Floral Pavilion in New Brighton. That’s a resort, I’ve been told, so you could make a day of it! Tickets are available from the box office and right now, there’s a mere 26 left. So be quick! The new Mama website is now LIVE! It’s been a long time coming (about two months in the making, on and off), but today, it finally arrived. 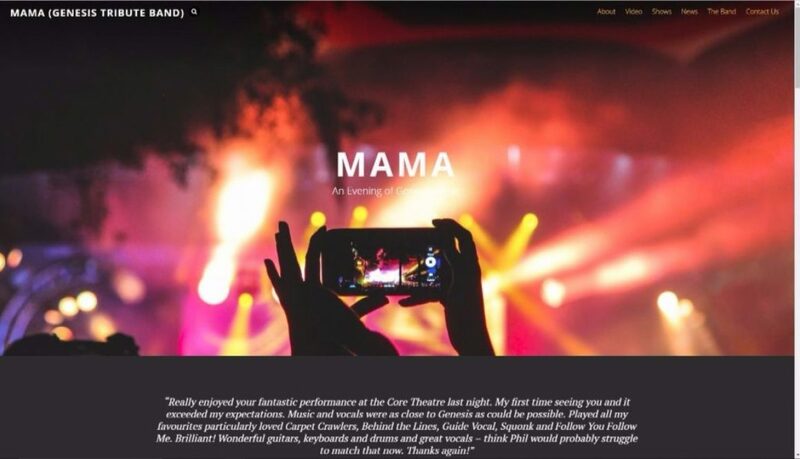 Yes, this is the all new Mama website! So, what does it do? Well, the main page is a sort of really big menu that takes you to all the other pages. We’ve got separate pages for our gig list, each member of the band and each news article (like this one you’re reading here). Obviously, we had a lot of content on the previous website, which will need pulling over to this new website, but that’s a big job – one that I’m going to have to do a little bit of work on each day. So, if there’s any content you’d like to see updated onto the new website sooner, rather than later, then let us know in the comments below. We are also looking for testers, so if you have a look around the new website and you come across any spelling mistakes, missing images, missing videos or anything that doesn’t look right, be sure to leave a comment below and we’ll get into fixing it as soon as we can. Also, feel free to tell us what you think of the new website, again in the comments section below. The original discussion forum we had is also now back up and running. You can reach it by clicking here. So, if you can remember your username and password (I can’t remember mine!) and you want to get stuck back into your discussions, by all means go for it. And finally, we also have a new online store coming. It’s not ready yet. In fact, it might be some way off. We shall have to see. But rest assured, we’ll let you know when it’s ready for a grand opening.